French niche line Brécourt has launched Subversif, a new unisex fragrance. The magic power of the composition is the classic balance of wonderful notes. Explosive start clings sparkling, brilliant combination of bergamot and blackcurrant, which could smash all to pieces, if not sweet enveloping tones figs. Amazing contrasts Heart notes of heliotrope, vetiver, cinnamon skin and excite the senses and does not give rise to an innocent desire. And maybe we should not hold back the rush and just plunge into the mouth of a volcano of passion, where seductive lure final chords of patchouli, amber and tobacco. In the end, life is given one, and every moment must feel fully. 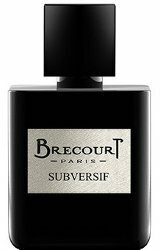 Brécourt Subversif is available now at Indiescents, $85 for 50 ml Eau de Parfum. “Volcano of passion” bwahaha! The notes sound right up my alley though, might have to sniff this one. I think it made my day (despite Blue Monday). Same here — cheered me up immensely this morning. …and all I smell is Google translate.